Dr. Wily was ready for anything. He had known his dastardly plans would end in failure someday, so after six months without contact his laboratory sprung to life. Monitors whirred into action, lights flashed, and the lab control panel booted up. In no time four hidden robots emerged. The robots then began a rampage in search of their master. Wily had done it again. Nothing would get in their way! --From the SNES Mega Man 7 instruction manual. 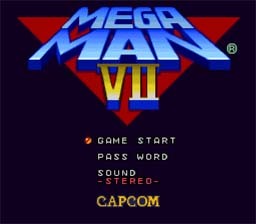 Play Mega Man 7 Now! Wily has broken out of prison! It's up to Mega Man to stop him again. This time around he may get some help in the form of the mysterious robot Bass. Mega Man 7 was the only Mega Man game made for the SNES, and it was quite rare, so few of us (including myself) have played it prior to Console Classix. It plays much like all the Mega Man series, but with better graphics, sound, and controls. In Mega Man 7 you still have your faithful companion RUSH and of course your trusty Mega Buster. One new thing to the game is you may purchase certain equipment at Eddie's Cybernetic Support Shop at certain times during the game. Well, I will leave it to you to save the world one more time. Good luck with Mega Man 7. Hold B when starting Shade Man's level (He must still be alive). Hold L and R and press start. Collect R, U, S, H to get the super adapter. Find Proto Man in the Cloud Man stage. Use Rush Search to dig in a flashing platform in the Turbo Man stage.